In Japan there is a tradition of pre New Years house cleaning, so I was going through my closets today and tossing out a year worth of collected nonsense when I came across this newspaper from May 1, 2008. It was an photograph I had taken of the super fresh Hip Hop beat making duo of Hifana. 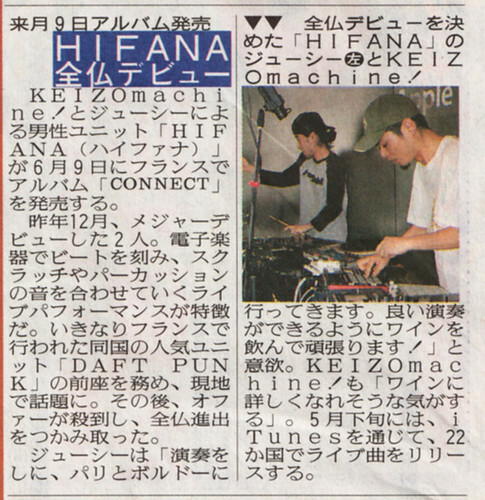 I had met Hifana a few weeks when doing a photo shoot and an interview for the French Blackpool Magazine prior to their dope set at the Apple Store in Shibuya. Hifana rocked a super set, and I snapped up a bunch of pictures of Juicy and Keizo Machine. A few weeks later Yuya, their manager, sent me the newspaper which my photograph had been published in. Hifana puts together a great show. They have toured the world and provide live beats across the globe. Check them out. This entry was posted on Monday, December 12th, 2011 at 5:58 am	and is filed under Publication Blog. You can follow any responses to this entry through the RSS 2.0 feed. You can leave a response, or trackback from your own site.